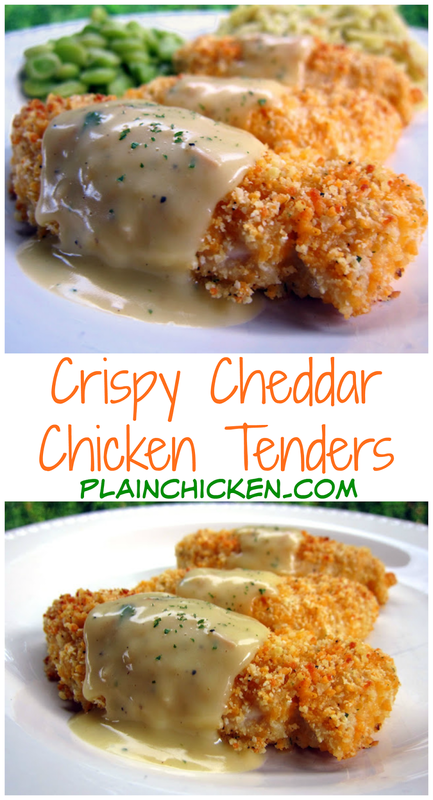 Crispy Cheddar Chicken Tenders Recipe - chicken tenders coated in cheddar, Ranch and Ritz Crackers then baked and topped with a delicious sauce. One of our all-time favorite chicken recipes. Can coat the chicken ahead of time and freeze unbaked for later. Make sauce while tenders bake. Quick and easy weeknight meal! We had this chicken for dinner last night and it was SOOOO delicious! I was disappointed that I was only able to eat two chicken tenders - I wanted eat all of this. The best thing about this chicken is the sauce. Food snobs need to go ahead and look away now. The sauce is made with cream of chicken soup and it is so tasty. It reminded me of another one of my favorite dishes - Chicken Roll Ups. 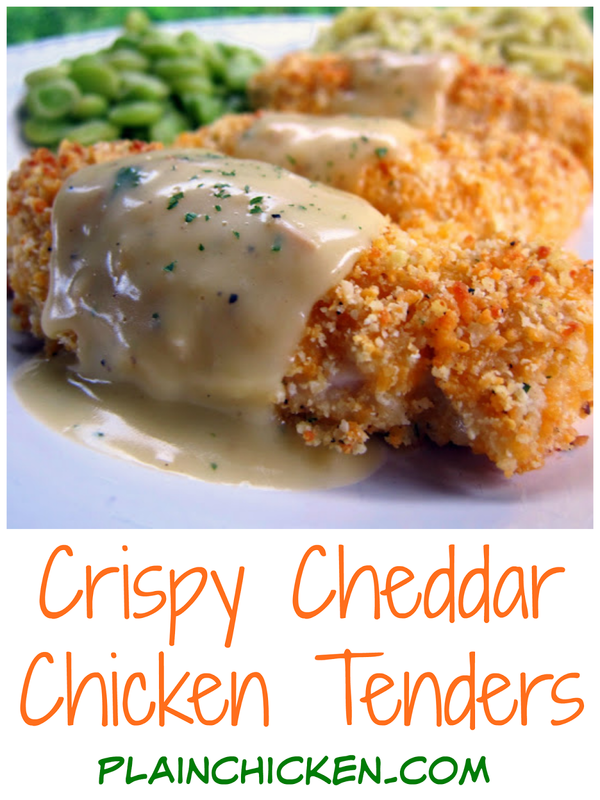 Make this tonight - I promise you won't be disappointed!! In the bowl of a food processor, combine crackers, cheese, Ranch mix and pepper. Pulse until you have fine crumbs. Pour into shallow bowl. In a shallow bowl, whisk together 2 eggs and 2 Tbsp milk. Dip chicken tenders into egg mixture and then coat in cracker crumbs. Place chicken on foil lined baking pan. Repeat with remaining chicken tenders. While chicken bakes, whisk together soup, butter, sour cream, milk, pepper and parsley. Bring to a boil and simmer until chicken is done. Spoon sauce over baked chicken. Before reading a word, I was hooked on the coating - it looks perfect. Both it and the sauce will be tried here soon. You had me at 'food snobs look away now'....that's how I know I'm going to LOVE a recipe. This looks completely yummy! Anything with a cracker crust has me drooling. Love how simple this is too using everyday pantry items. Does this freeze OK (without the sauce)? 1 1/2 cups shredded cheddar I'm assuming? Can't imagine it'd be anything else. Barbara - I did use cheddar cheese, but I am sure it would taste fine with your favorite cheese. What is the unit of measurement on the cheddar cheese? The recipe currently states 1 1/2. I'm going to guess that it's TBSP and make this for dinner tonight. I'm making it right now, & I used 1 1/2 cups and it seemed like the perfect amount! Pinned. This sounds delicious Stephanie. Beautiful dish! I don't care if it does use canned soup. Then again, I wrapped bacon around tater tots ;) I'm not exactly a food snob, lol. Tried it--didn't care for the sauce. The soup taste is still too strong. So the last one I ate without the sauce, and it tasted much better that way. The coating was really good. Found this recipe on pinterest earlier this year and I make it all the time because my husband and I love it so much. The sauce takes it over the top! Sara - potatoes would be good - you can put some of the sauce on top. We had rice-a-roni and Lima beans with this. Sounds perfect. Thanks for replying back so quickly. Very excited!!!! Making potatoes. Wow, I made this last night. LOVED IT! I loved the sauce as well. My 4 year old insisted on using ketchup instead because "I don't like sauce, mommy", but he still seemed to love it. I made the Parmesan Basil Orzo with it, and also had some leftover fresh green beans with the mean.